The Seahawks have seen the Gates of Hell. He’s a 34-year-old tight end who seems perpetually injured but who still finds ways to burn opponents. On a scorching Sunday in San Diego, Antonio Gates caught fire — and three touchdown passes — against a Seattle defense that appeared ill-prepared for the heat and the physical pounding the Chargers’ offense put on it in San Diego’s 30-21 win. The Seattle defense — so good at stopping tight ends last season — apparently forgot the formula in the San Diego heat. Last postseason alone, the Hawks held Jimmy Graham to one catch for eight yards, Vernon Davis to two receptions for 16 yards and Julius Thomas to four for 27. But Gates, who was hindered by a hamstring injury all week, caught seven passes for 96 yards and scored against linebackers Malcolm Smith and K.J. Wright and safety Kam Chancellor. It was the first time Gates had caught three TD passes since a 28-20 win over Kansas City in 2005. Rivers completed 28 of 37 passes (75.7 percent) for 284 yards and the three scores to Gates. He threw no interceptions and was sacked only once. The Seattle defense just couldn’t get off the 120-degree field — unless it was due to cramping. Chancellor, Earl Thomas and Byron Maxwell all left to get intravenous fluids in the second half. 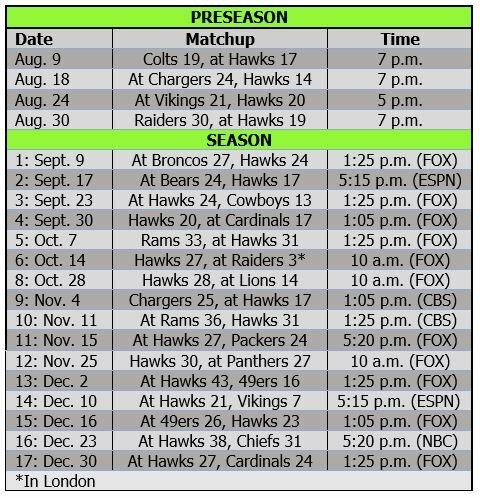 Before the game, Seahawks general manager John Schneider told 710 ESPN that the Hawks had played in this kind of heat before — e.g., in the opener at Carolina last season and at Miami the year before — and he felt the team was prepared for it. It didn’t look like it was. No, the deciding factor was the brilliance of Rivers, who was the key to the Chargers holding the ball for 42 minutes and converting 10 of 17 third downs (they were 9 of 13 at one point). 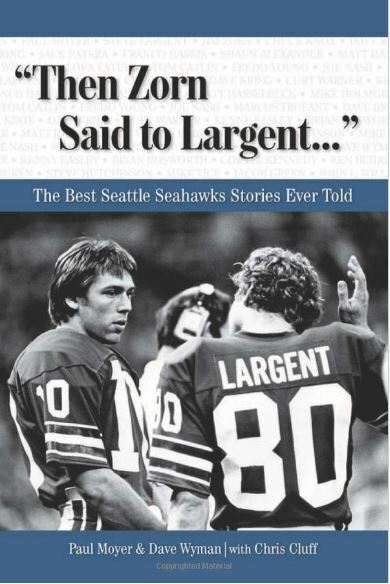 The longer the Seattle defense was on the field, the harder it became to get off it. 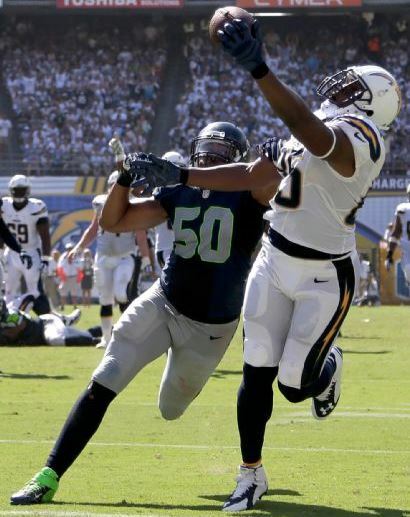 The Chargers had 26 first downs and ran nearly twice as many plays as the Seattle offense (75-40). No Seattle opponent had held the ball for 40 minutes since October 2011, when Atlanta and Cleveland both did it. The Falcons ran 78 plays to Seattle’s 53 in a 30-28 win in Seattle. Cleveland had the ball for almost 43 minutes in 6-3 win as a Seattle offense led by backup QB Charlie Whitehurst went 2 for 12 on third downs. The Browns ran 84 plays, Seattle 50. On Sunday, the Chargers ran 95 percent more plays than the Hawks — the biggest disparity in possession since the New York Giants ran 79 plays to Seattle’s 37 (113 percent more) in a 41-7 blowout in 2010. Whitehurst was Seattle’s quarterback in that game, too, as the Hawks turned the ball over three times and converted just 1 of 8 third downs. The offense didn’t carry nearly that kind of blame in this game — although Russell Wilson received unexpectedly constant pressure. The defense also failed to record a turnover for the first time since Week 9 last season, when Seattle had to rally from 21-0 down to beat Tampa Bay in overtime. The Hawks had their chances in this one as the Chargers put the ball on the ground three times — and recovered it themselves each time. 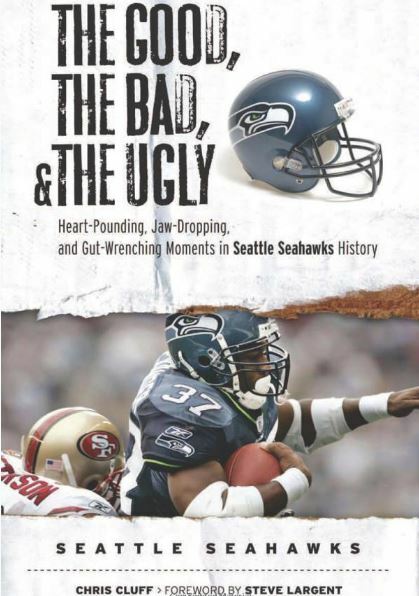 The Hawks fumbled it a couple of times themselves, though, and the Chargers scored a touchdown off Percy Harvin’s turnover on a kick return at the Seattle 28-yard line. That wasn’t the only grievous mistake the Hawks made. They missed a bunch of tackles again — like the opener vs. Green Bay — and had some terrible penalties at key times. The worst — and most inexcusable — was Bruce Irvin’s personal foul for pushing Rivers in the back after the quarterback had run out of bounds for a 1-yard gain on third-and-7. The Chargers got a new set of downs and Rivers hit Gates for a 21-yard score three plays later, putting San Diego up 27-14 late in the third quarter. The Seahawks cut it to 27-21 and then had a chance to try to win it with three minutes left, but they were backed up at their 11-yard line and couldn’t get a first down on four plays. “It was a tough game,” Wilson said. “We had a shot, and when you go on the road and play a great team you want a shot. But we just fell short.